Oolong tea is a true tea that is famous for its health benefits. Oolong tea may help increase weight loss and can boost the immune system to prevent disease. It has been used for centuries as part of traditional medicine and is consumed daily in Asia. This tea is a staple in Chinese restaurants and has a cult following in India and other communities across the globe. Oolong tea has grown in popularity over the past century in the western world. It blends the characteristics of green and black teas into a sweet or roasted flavor that tickles the senses. Immerse your senses in a world of flavor and aroma with the best oolong tea varieties. Want to pick up premium oolong tea? Check out our collection of the best oolong teas right here. Oolong tea, or wu long tea, is a mildly oxidized tea. It is considered a middle ground between green tea and black tea. Oolong tea is also often considered similar in flavor and aroma to pu-erh teas. One of the four true teas, oolong tea is made from the leaves of the Camellia sinensis plant. The difference among the true teas arises during the production process. Green tea and white tea leaves are not oxidized while oolong tea and black tea leaves are oxidized. Black tea leaves are oxidized completely, but the oxidation of oolong tea leaves is stopped before the process is complete. This results in a semi-oxidized tea that has all the good aspects of both unoxidized and oxidized teas. Oolong teas themselves can vary drastically in flavor depending on how long they are oxidized. In general, oolong teas undergo anywhere from 8 to 80 percent oxidation. Each tea master uniquely tailors the oxidation process, resulting in a world of flavor that makes oolong an extremely versatile tea. The shapes of oolong teas also set them apart. Oolong tea leaves are curled, rolled, and twisted into long spindles or balls. The shaping technique enhances the visual look and aroma of the tea leaves. This essential step helps to differentiate low quality leaves from high quality leaves. Oolong tea is most commonly cultivated in China and Taiwan. The largest growing regions include the Fujian and Guangdong provinces of China. The most famous oolong teas are produced in China in the Wuyi Mountains. The second largest producer of oolong teas is Taiwan. 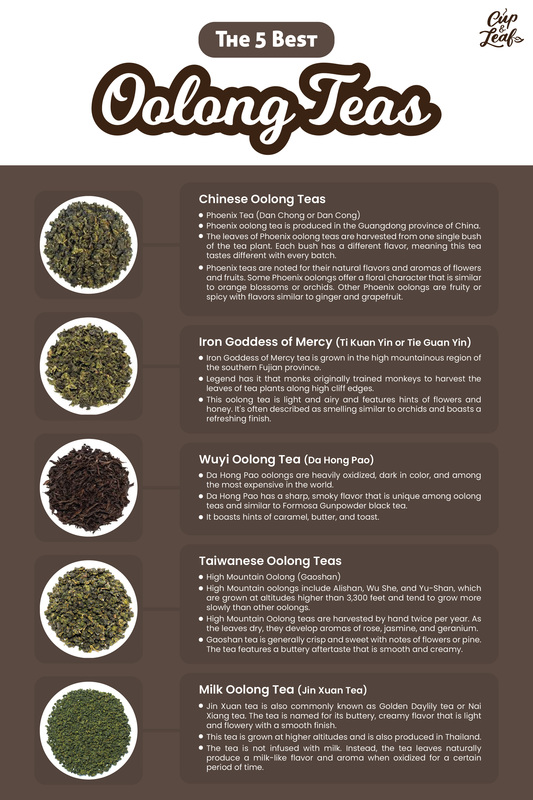 Oolong tea vary wildly in flavor thanks to their wide range of oxidation levels. Oolong tea can be sweet and fruity or woodsy and rich. The aroma of lighter oolong teas contain hints of honey while other bolder aromas are roasted and complex. Phoenix oolong tea is produced in the Guangdong province of China. The Chinese name for this tea means “single bush." The leaves of Phoenix oolong teas are harvested from one single bush of the tea plant. Each bush has a different flavor, meaning this tea tastes different with every batch. Today, Phoenix tea is also used to refer to all oolong teas produced in Guangdong province—not just the ones from a single bush. Phoenix teas are noted for their natural flavors and aromas of flowers and fruits. 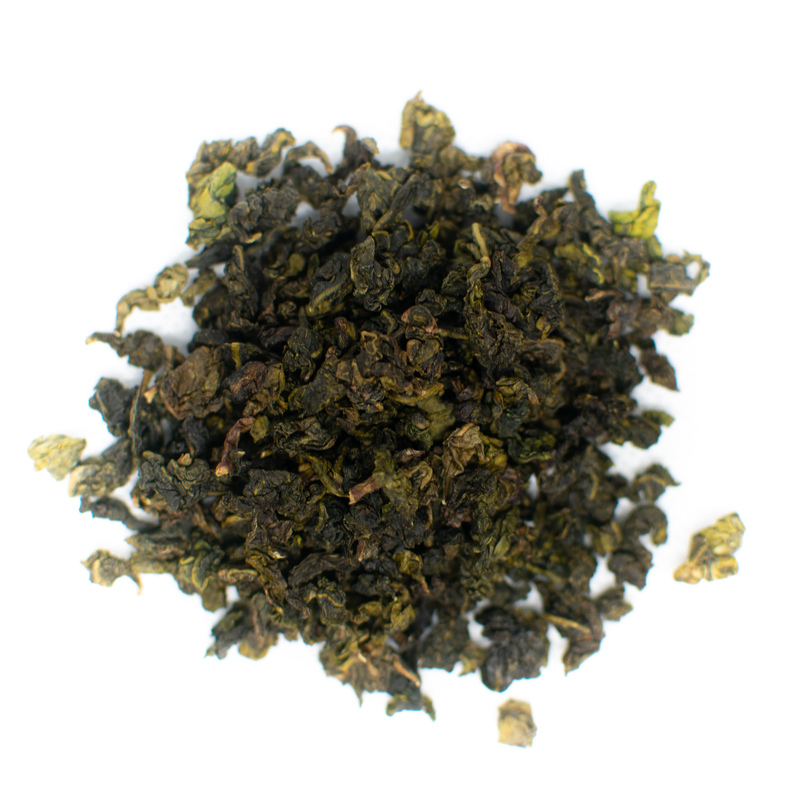 Phoenix oolong tea has a rich, full-bodied feel. 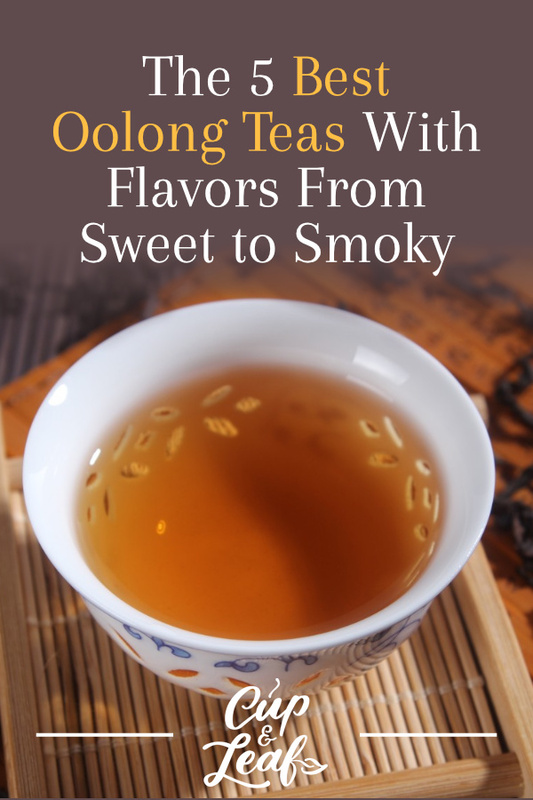 Some Phoenix oolongs offer a floral flavor that is similar to orange blossoms or orchids. 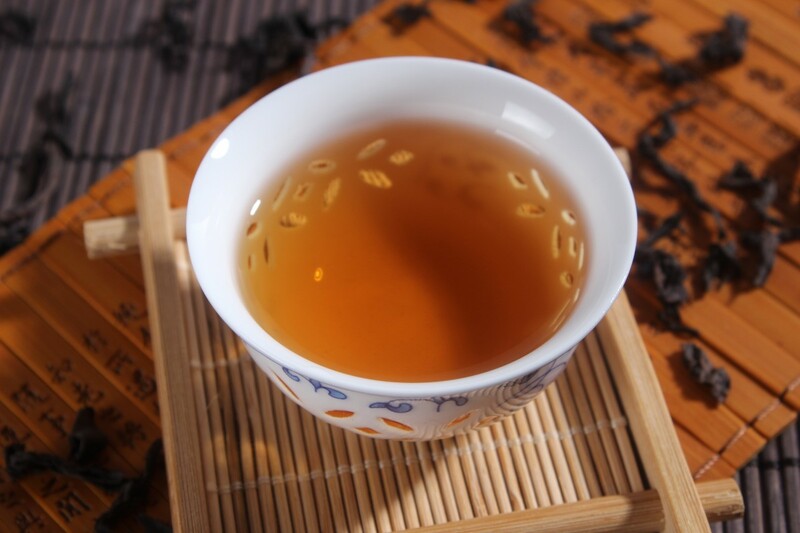 Other Phoenix oolongs are fruity or spicy with flavors similar to ginger and grapefruit. Try our premium grade Iron Goddess of Mercy Oolong Tea and fall in love with the airy, floral flavor. This type of oolong tea is arguably the most famous Chinese tea. ‍Iron Goddess of Mercy tea is grown in the high mountainous region of the southern Fujian province. The tea leaves are harvested specifically in the Anxi region. Legend has it that monks originally trained monkeys to harvest the leaves of tea plants along high cliff edges. These tea leaves were often called “monkey-picked” and constituted the highest quality oolong teas. These oolong teas were only used to brew tea for the emperors of China. Today, you can get your hands on high mountain oolong teas reserved for royalty. Iron Goddess of Mercy teas are available at most tea shops and in online stores such as Amazon. 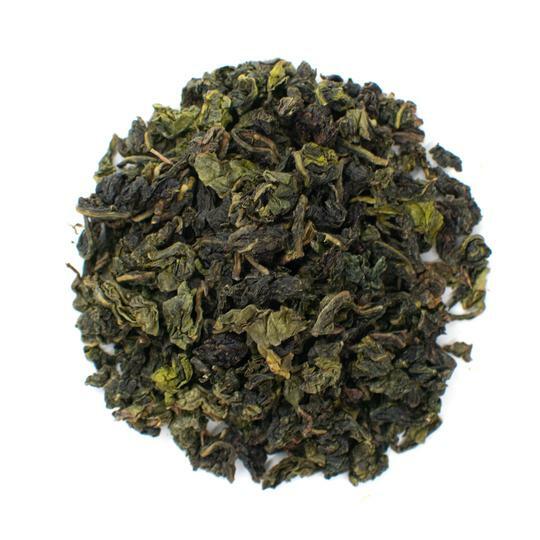 This oolong tea is light and airy and features hints of flowers and honey. It's often described as smelling similar to orchids and boasts a refreshing finish. On the other end of the oolong spectrum is Red Robe tea. Da Hong Pao oolongs are heavily oxidized and dark in color. This tea is revered for its health benefits and legend has it that this oolong tea saved the mother of an emperor in the Ming dynasty. 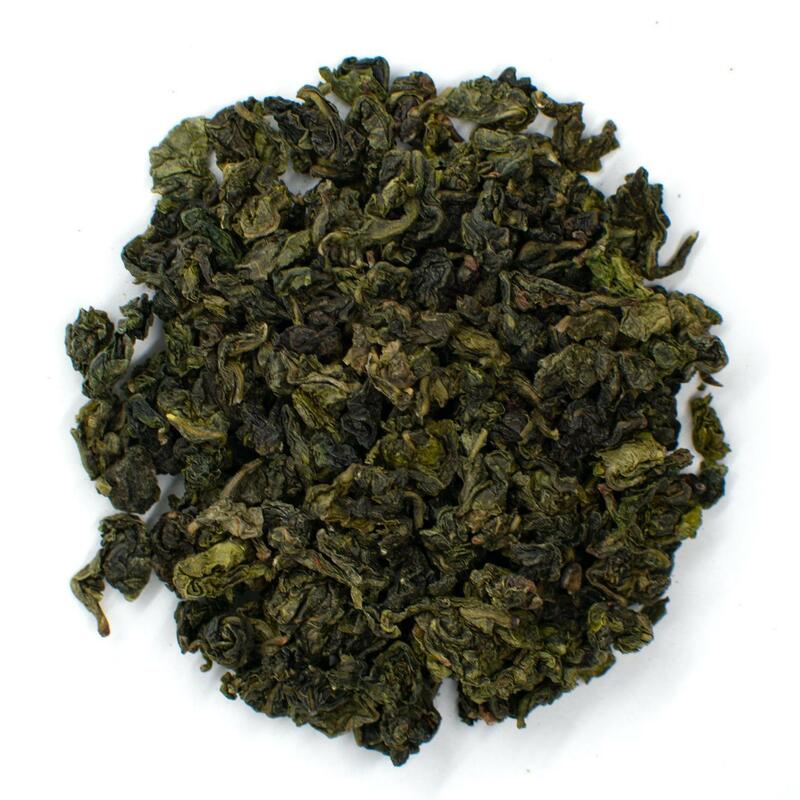 Da Hong Pao has a sharp, smoky flavor that is unique among oolong teas and similar to Formosa Gunpowder black tea. It boats hints of caramel, butter, and toast. These oolong tea leaves are fat, bold strips with a slightly glossy appearance. This roasted oolong tea is typically bright orange of yellow in color. Da Hong Pao can be one of the most expensive teas in the world. The highest quality tea leaves are harvested from the original tea bushes, which are estimated to be over 1,000 years old. Da Hong Pao can cost upwards of $1,000,000 for just 1 kilogram. If money isn't an option, the highest quality Da Hong Pao oolong is considered the gold standard for serious tea lovers with deep pockets. High Mountain oolong teas consist of a variety of different oolongs grown at the highest elevations in Taiwan. High Mountain oolongs include Alishan, Wu She, and Yu Shan. These oolongs are grown at altitudes higher than 3,300 feet and tend to grow more slowly than other oolongs. High Mountain oolong teas are harvested by hand twice per year. The leaves harvested in October are known as winter Gaoshan and the leaves plucked in June are known as spring Gaoshan. The leaves are spread out on a large tarp to dry before undergoing oxidation. As the leaves dry, they develop aromas of rose, jasmine, and geranium. Once the Gaoshan develops aroma, the leaves are folded and withered for eight hours. Tea masters then oxidize the leaves before they are sorted and packaged for sale. Gaoshan tea is generally crisp and sweet with notes of flowers or pine. The tea features a buttery aftertaste that is smooth and creamy. Drink up, with our Milk Oolong Tea that smells creamy and delicious the second you open the bag. Jin Xuan tea is also commonly known as Golden Daylily tea or Nai Xiang tea. The tea is named for its creamy flavor that is light and flowery. This tea is grown at higher altitudes and is also produced in Thailand. 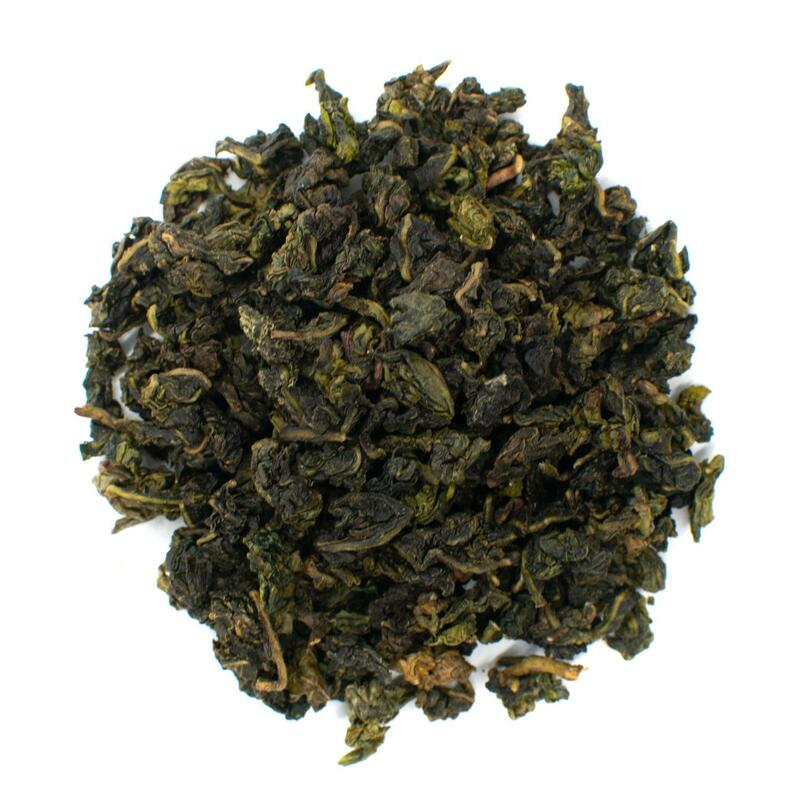 Milk oolong tea is characterized by a buttery, creamy flavor with a smooth finish. The milky flavor of Jin Xuan tea is not produced by infusing it in milk. Instead, the tea leaves naturally produce a milk-like flavor and aroma when oxidized for a certain period of time. There are some artificial milk oolongs on the market, though these are generally labeled as flavored oolongs. We recommend using loose leaf teas rather than tea bags when brewing oolong tea. Loose teas contain the entire leaf and more release flavor more efficiently when steeped. Tea bags are often lower quality since they contain broken leaves and dust of the tea leaves. Use high quality loose leaf oolong tea whenever possible for the best flavor and to maximize the tea drinking experience. Start with 3 grams or 2 teaspoons of loose leaf oolong tea for every 8 ounces of water. Oolong teas are best prepared with hot water, not boiling water. Aim to prepare oolong tea using water with temperature between 200 and 205 F.
If you do not have a temperature controlled tea kettle, bring water to a boil on the stove. Remove from heat and let the water cool for 2 minutes before adding the tea leaves. Oolong tea leaves should steep for 2 to 3 minutes. High quality oolong tea leaves can be resteeped several times. In general, the same oolong tea leaves can be used 3 to 5 times each. Whether you prefer the taste of Taiwanese or Chinese oolong teas, tea drinkers are sure to find a new favorite tea. Oolong teas offer an immersive tea experience with flavors ranging from sweet and floral to smoky and roasted. The beauty of oolong teas is sure to visually dazzle your sense while the aromas and flavors excite your taste buds. Try these popular oolong teas and fall in love with these true tea delights.